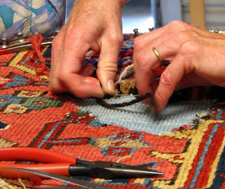 Blocking can restore the shape of a rug that has become distorted from use. In the case of a rectangular rug, the blocking procedure means that we attach the rug to our blocking board with the rug’s edges straightened and the corners at perfect right angles. The rug is kept in the blocked position for 4 days to achieve the best result. 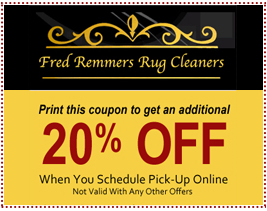 Here at Fred Remmers, rugs are blocked with their pile sides facing down, which allows us to apply natural starch to the backs of the rugs during the stretching and shaping process. Starch helps blocked rugs maintain their newly restored shapes after coming off the board. 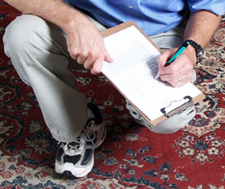 After a custom made rug or a hand tufted rug is blocked, we may recommend coating the back of the rug with latex. 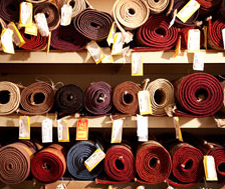 We recommend latex for several reasons: the back of the rug was not finished properly at the time of manufacture, the rug’s seams have become loose from “wear and tear,” or the rug requires the additional sturdiness that the combination of latex and a new cotton backing will provide. 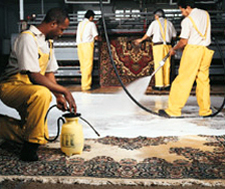 After the standard blocking procedure has taken place, and latex has been spread across the back of the rug, the latex is allowed to partially dry. The sticky, rubbery surface adheres tightly to cotton muslin, which is smoothed over the latex layer. After the latex is completely dry, the overlapping edges of the muslin are trimmed away. Get in touch with us today to get started, or learn more about our rug cleaning experts and our other rug repair services.